The move starts with Barcelona having possession in Villarreal’s half, however the hosts are in a comfortable position to defend. 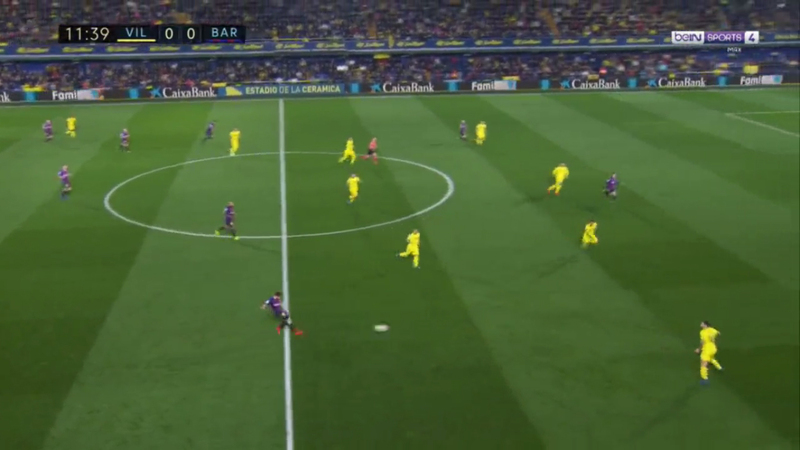 Barcelona play backwards towards their defenders, moving the ball along the backline and giving Villarreal the opportunity to press. 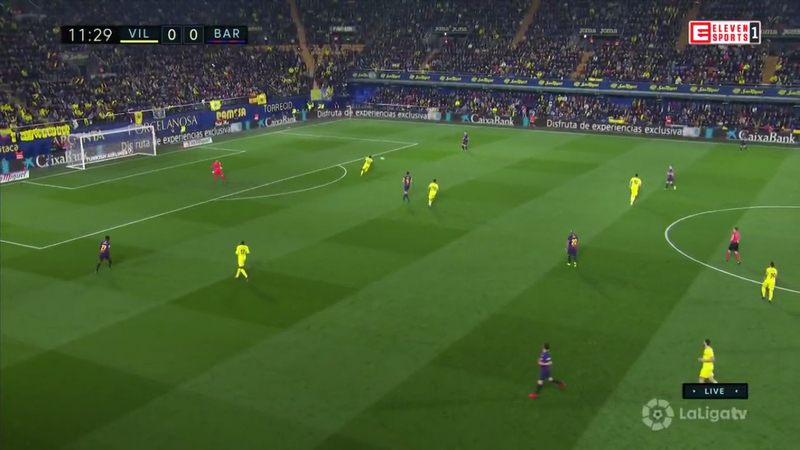 Villarreal take the bait and move up the pitch while Barcelona play back towards their goalkeeper and spread out across the pitch. 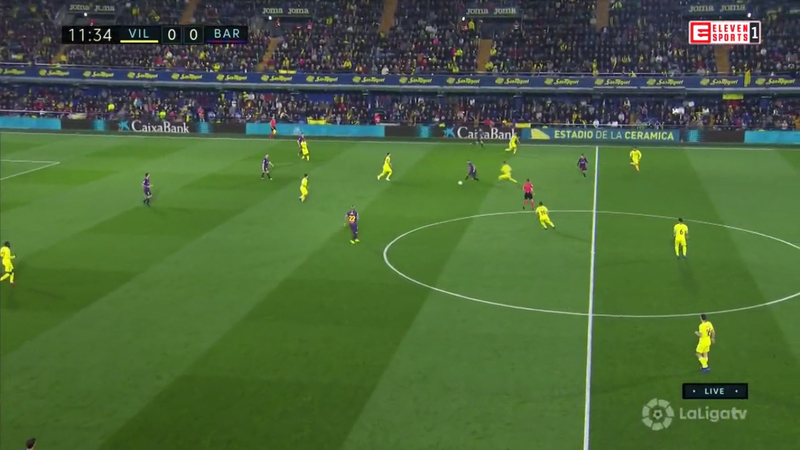 With Villarreal now stretched, Barcelona take advantage of the gaps and play a long pass forward to Luis Suarez. The Uruguayan is dropping off the frontline to pick up the ball from Clement Lenglet, so Ramiro Funes Mori follows to stop him turning. Suarez barely has enough time to spread the ball out to Sergi Roberto before Funes Mori is on top of him. 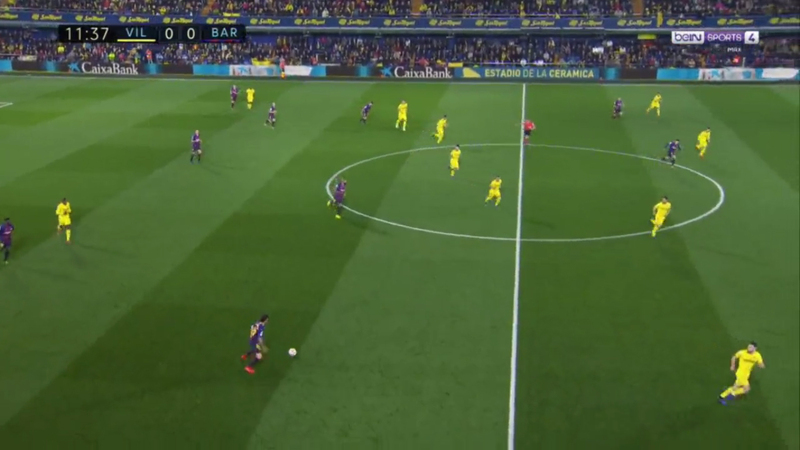 Roberto receives the ball in space and with Villarreal’s defensive line drawn high up the pitch, both Malcom and Philippe Coutinho look to take advantage by making runs in behind. Alfonso Pedraza’s wide positioning allows Roberto to play a pass straight in between him and Victor Ruiz. The wing-back could be criticised for this, however this positioning makes sense as he’s playing in a back five – Funes Mori stepping up to stop Suarez has left the backline stretched with just four defenders. Alfonso is caught out having to turn as the pass is played behind him and Malcom gets to the ball first, forcing Ruiz across to meet him as Alfonso doesn’t get anywhere near to catching up. Malcom is simply too fast though and Ruiz can’t get close enough either as the Brazilian bears down on goal. Alvaro Gonzalez had initially been tracking Coutinho, stepping up to catch him offside only for Malcom to pick up the ball instead. As soon as Coutinho realises Malcom is picking up the ball, he changes his run, moving towards the far post on Gonzalez’s blindside. 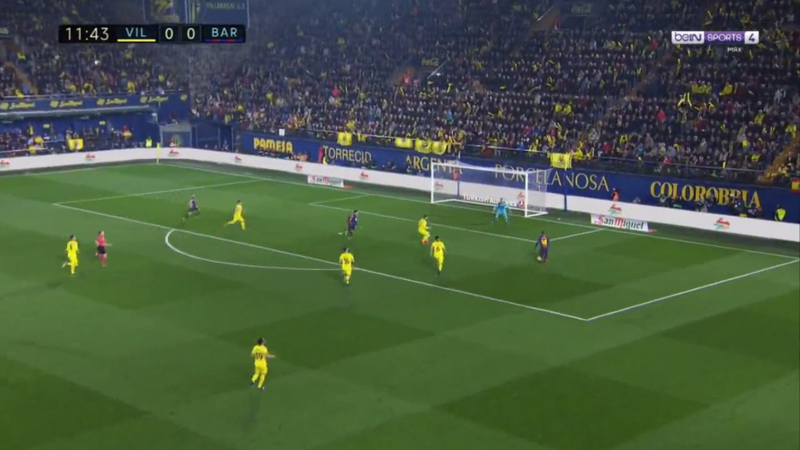 Malcom continues to sprint at goal and Gonzalez tries to put himself in a position to put off Malcom while blocking the pass into Coutinho, and Sergio Asenjo eventually has to come out to narrow the angle. As soon as Asenjo steps out, Malcom slides the ball between the goalkeeper and Gonzalez for Coutinho to tap in at the back post. 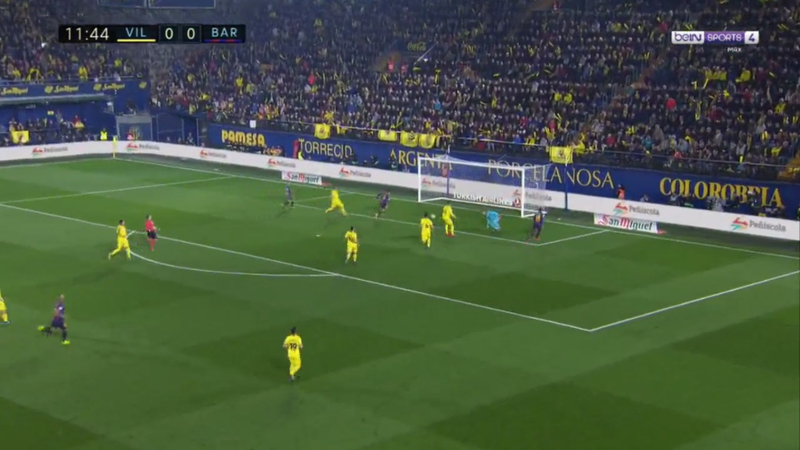 Coutinho’s initial run would have seen him caught offside, but Malcom picking the ball up first allows him to use it to his advantage, staying several metres ahead of Villarreal’s defence as they rush back. Gonzalez is forced into a position that leaves Coutinho free at the back post, whereas Mario Gaspar was initially picking up Jordi Alba on the right side and can’t get back in time to stop Coutinho.